Situated in prestigious University Park on a stunning 73’ x 160’ corner lot with a front side driveway, gorgeous landscaping and an abundance of mature trees with tree lighting, this wonderful French inspired traditional residence was custom built with one owner and has fabulous drive-up appeal. With its hand trowled Portland cement stucco over a block exterior, the home exudes warm elegance with its sophisticated and graceful interiors and top-quality amenities. 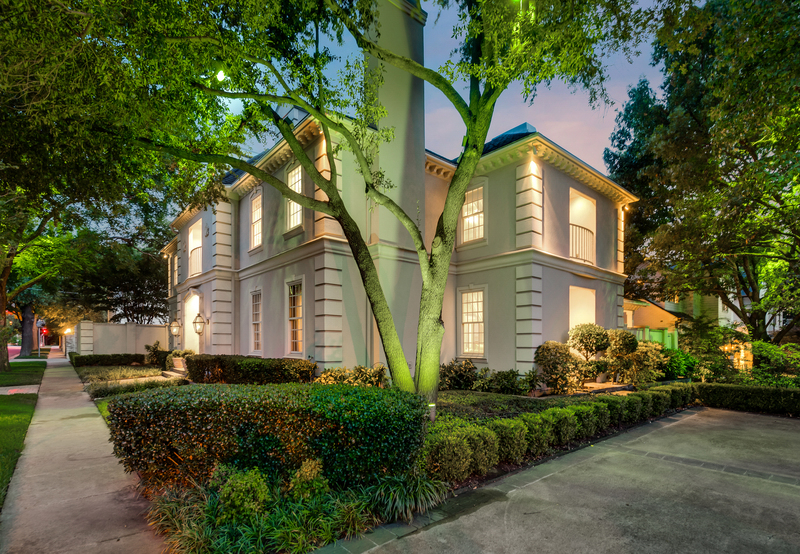 Details include 10’-foot ceilings downstairs, spacious entertaining rooms with elegant proportions, handsome hardwoods, deep crown molding, sculpted archways, cross beamed ceilings and wonderful marble and granite finishes contribute to the grandeur of this beautiful home. Providing for great entertaining flow, the exceptional three-story home is graciously appointed with approximately 5,809 square feet, four bedrooms, 5.1 baths, two gathering areas, two dining areas, four fireplaces, an elevator, wet bar, two balconies, a side patio, covered veranda, landscaped grounds, and a three-car attached garage with workshop area. Through the oversized cast stone-surrounded wood door, the dramatic center entrance hall gleans with a 10-foot ceiling trimmed with deep crown molding and wainscoting, Italian marble-patterned flooring, dual coat closets, and a grand staircase, with wood balusters, leading upstairs to the third level. Elegant balusters also look down to the first floor. Graceful sculpted archways allow entry to the exquisite formal rooms and also lead to the rear of the home. Both with handsome hardwoods, elegant drapery and scenic views of the front landscaped grounds, the oversized living room features silk-lined wall coverings with wainscoting, built-ins and also opens to a side patio, and the richly paneled dining room is graced by a cross beamed ceiling, marble surrounded fireplace, with a wood carved mantle, and abundant built-in bookcases with storage. Capped by a cross-beamed ceiling, the oversized family room showcases a granite surrounded fireplace, with a wood carved mantle, handsome hardwoods, and a temperature-controlled cedar wine closet with floor-to-ceiling wine racks. Conveniently serving the space is a wet bar, which houses granite counters with a mirrored backsplash, a bar sink, paneled SubZero refrigerator with ice maker, and an impressive granite-topped bar serving area. Additionally, French doors open to the front side grounds plus a pair of light-filled sliding glass doors also open to reveal an expansive covered veranda. Nearby, a spacious granite kitchen boasts stainless and paneled appliances, including a Jenn-Air gas cooktop with griddle, a KitchenAid double oven, dishwasher and microwave, and a paneled SubZero refrigerator with freezer, an island with breakfast bar, a desk area, huge walk-in pantry, and a white triple bowl ceramic sink with a scenic window above overlooking the veranda. Ideal for entertaining guests, an expansive butler’s pantry is replete with a bar sink and abundant built-ins. Additionally, a back staircase leads upstairs. The kitchen also flows to a light-filled morning room, which features a granite surrounded fireplace and also opens to the veranda. An elevator, replete with gleaming hardwoods, serves the first and second levels of living, and an elegant powder room with a pedestal sink, marble flooring and stylish wall coverings, rounds out the first floor. Second level of living is equally impressive. French doors open to reveal a Juliet balcony, with Pennsylvania Bluestone flooring and also looks down to the front landscaped grounds. Centered by a granite-surrounded fireplace, with a raised hearth, the luxurious, oversized master suite boasts abundant built-ins with a desk area, neutral carpeting and French doors opening to a private, iron-grilled Juliet balcony with Pennsylvania Bluestone flooring and also looks down to the front side grounds. The adjacent His and Hers marble baths are elegant and spacious. The “Hers” white Calacatta marble bath is appointed with a large vanity desk area, a jetted tub, separate shower, abundant built-in storage and an immense walk-in closet. Featuring special finished cabinetry, the handsome “His” marble bath is also highlighted by a separate shower, abundant built-ins and a huge walk-in closet. Two additional ensuite bedrooms range in size and style, but both with neutral carpeting, love seating, extra-large walk-in closets and elegant full baths. Additionally, two expansive large cedar closets provide for seasonal storage space. Fully equipped, a utility room houses built-ins with a stainless steel sink and a SubZero refrigerator, a drip dry and hanging rack area, built-in ironing board, storage closet with a central vacuum station, and also provides room for a full-size washer and dryer. Perfect for relaxation, the third floor reveals a spacious fourth bedroom, with neutral carpeting and abundant storage space, a separate sitting room with desk area, and an elegant full bath with large walk-in closet. The fourth bedroom may also be conveniently used as a game or exercise room. Outside, the backyard and side grounds set the tone for a sophisticated atmosphere for entertaining. Marked by columns, an exceptional outdoor entertaining area features an expansive covered terrace with Pennsylvania Bluestone flooring, ceiling fans and also overlooks a shimmering fountain and beautifully landscaped grounds. Also featuring Pennsylvania Bluestone flooring, the spacious side patio overlooks verdant landscaped grounds and is completely private. An oversized three-car attached garage, with epoxy coated flooring plus a spacious workshop area, with abundant built-ins and a stainless steel sink, completes this fabulous residence. Additional amenities include four zones of HVAC, multiple water heaters, and a stucco, iron and wood fence.